It was two decades ago that Kiyoshi Iwai moved from Japan to Los Angeles. During that time he’s seen the traffic congestion in Los Angeles swell to what he sees as unsustainable levels with an equally dramatic effect on climate change. About three years ago he decided to do something about it. He started a bike company. The name of the company is Cero, which is Spanish for “zero,” as in zero emissions. To make a car replacement, he knew it had to be a cargo bike with good range and dependability. For three years he and his staff made and tested several prototypes. What they made culminated in the Cero One with a unique, modular design. It’s available now in 2018. Cero chose a unique design for the bike. It has a stiff, low-step-through aluminum frame for easy rider mounting and dismounting, tremendous adjustability in the seat height, and the stem adjusts in both angle and can telescope up or down to customize the fit for almost any rider. The wheel configuration is definitely different from most bikes sold today. A 26-inch rear wheel was chosen for stability, and a 20-inch front wheel is used to allow the weight on the front to sit lower and out of the way. The integrated lighting is great with the headlight affixed below the front rack so you don’t have to worry that your groceries will block it. It’s powered by the main battery, and it uses very little power. Front and rear fenders keep water off you and your payload. There are several options you can add to the bike. You can choose from one of four colors: Halu Blue, Lightning White, Midnight Black or Shio Grey. It comes with a front platform, with plenty of easy attachment options for cargo. Imagine being a pizza delivery person and being able to strap your insulated bag full of pies on the front and get there in less time than a car, especially during rush hour. It has mounts for a variety of accessories in case you want to mount a bottle cage, coffee mug holder, lock holder or anything else you’d like to bolt on. An Abus cafe lock is included and keyed the same as the battery. An optional Abus chain lock can also be keyed the same. There are also two optional baskets. The small basket, a narrower one, is handy for a grocery bag or two, which adds $50 to the price of the bike. The big basket, which is twice as wide, adds $100 to the price. Four bags of groceries are no problem with the large basket, and the modular front setup is rated to hold up to 55 pounds. The baskets can be used in the front and/or rear of the bike, so you can have two different baskets, or just use the modular platform. It’s a smart system where accessories can be bolted on as desired. There’s also a receiver for a Thule Yepp child seat; you literally just clip it in and it’s ready to go. The front cargo system is affixed to the head tube, not the fork, making it very stable. It’s visually tricky at first, because when you turn the handlebars, you don’t see the front wheel turning; you see the rack not moving. It takes a while to get used to, more when pushing it around by hand than when actually riding. The rear rack can also hold up to 55 pounds, but Cero recommends a combined ratio of 55 pounds in the front and 22 in the rear, or vice versa at 55 pounds in the rear and 22 pounds in the front. The total weight limit on the bike, including rider and cargo, is 300 pounds. The kickstand isn’t a side stand but rather a bike stand that holds the bike perfectly upright. This is important for a cargo bike. With a side stand, when you start loading cargo, it can tip the bike. Couple the bike stand with the head tube-mounted front rack and loading cargo is very easy. Other accessories include a Yepp seat for $199, an Abus chain lock that’s keyed the same as the cafe lock on the bike for $49.95, and Abus chain-lock bag to carry your chain or a .5-liter water bottle on the frame for $24.95, and even a Carver surf rack if you want to use the bike to take your board to the beach. The built-in lighting on the bike is perfect for dawn patrol! The rear rack is set up for easy mounting of a Thule Yepp child seat. 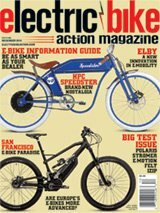 When it came time to choose a powerplant, Cero made an interesting call with the Shimano STEPS E6000 motor, but they mated it with an E8000 500-watt-hour battery. This is a smart move, as it gives enough capacity to make the range significant, even if you’re carrying a lot of cargo. If you put your kid on the back and their backpack and your briefcase on the front, you may be able to drop off the kid at school or daycare and get yourself to work for a week on one charge—maybe more. Or, if you like taking long road trips, you could easily carry an extra battery and charger, plus all your gear, tent, clothing, etc. The E6000 has plenty of power to get you going, even when heavily laden with cargo. Add to that the Shimano Deore 1×10 gearing, and you can even flatten hills with it. It’s pedal assist only with a torque sensor, so you can’t simply ghost pedal it to keep it going. This is our preference on bikes, anyway. 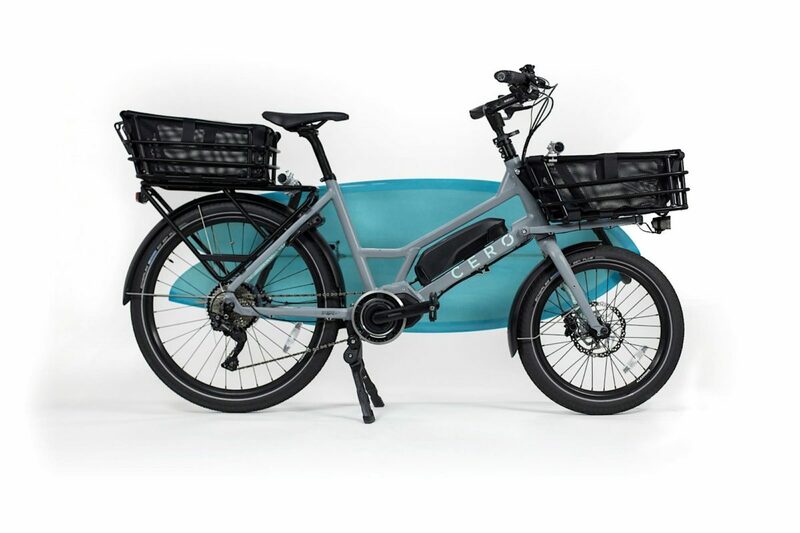 This bike is geared towards those who want to replace a car (or use a car less often) for commuting, running errands, shopping or taking the kid to school. You can tow a trailer with it if you have more than one child. In areas and times of heavy traffic congestion, we were able to get to places much faster than if we drove there. The controls are laid out very ergonomically, and the handlebars have Ergon grips on the handlebars with a very nice, comfortable sweep. The seat height is adjustable to fit riders from 5-foot-2 to 6-foot-2, and the telescoping stem was nice on longer rides to adjust riding position to alleviate fatigue. It’s a very comfortable and fun bike to ride, even on long distances. Santa Monica, where the company is based, has ample bike lanes and paths that make it easy to get anywhere, and it was fun to take it out of the area on longer rides. It garnered some good looks and comments. The bike feels planted, even cornering under weight, thanks to the matched Schwalbe Big Ben Plus tires. You can run 35–55 psi, and even at 55 psi with plenty of cargo, the high volume of the 2.15-inch tires took up bumps to keep them from transferring to the rider too harshly. There’s not much rain in SoCal this time of the year, but when going to and from various farmers’ markets, there’s always water in the road. The full fenders did their job perfectly in keeping our pants and our produce dry. Buying options with the Cero are a little different than most bikes. You can buy direct from the headquarters in Santa Monica, or order online and have it shipped to your local bike shop for assembly (free shipping), direct to your door (free shipping, some assembly required) or shipped to your local Velofix service for $99. They currently only ship to the lower 48 states, but they’re looking to add Hawaii and Alaska shipping soon. We found the Cero One to be a very versatile bike. It’s obvious that Kiyoshi and his crew really did a proper job of research and prototyping. The bike rides well and carries plenty of cargo. We quickly found ourselves riding it a lot locally instead of taking a car. It’s fun to ride, well-built and gets you wherever you want to go quickly. Range is superb. As a first-time effort, we’d say the Cero is a home run.